NOTES: Short run kit with resin parts. This version first rolled off the assembly lines in June 1941. The first few models were shipped to the Erprobungsstaffel (formerly from II./JG 26 Schlageter) for further testing. 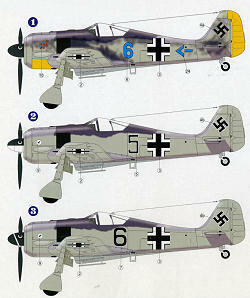 Following this testing, the Fw 190 A-1 entered service with II./JG 26, stationed near Paris, France. The A-1 was equipped with the BMW 801 C-1 engine, rated at 1,560 PS (1,539 hp, 1,147 kW). Armament consisted of two fuselage-mounted 7.92 mm (.312 in) MG 17s, two wing root-mounted 7.92 mm (.312 in) MG 17s and two outboard wing-mounted 20 mm MG FF/Ms. The new longer propeller spinner and the cowling bulges, which became asymmetrical "teardrops" in shape, remained the same for the rest of the A-series. The panel immediately behind the exhaust outlets was unslotted, although some A-1s were retrofitted with cooling slots. A new hood jettisoning system, operated by an MG FF cartridge, was introduced. The pilot's head armour changed in shape and was supported by two thin metal struts in a "V" shape attached to the canopy sides. The standard radio fitted was the FuG 7, although some A-1s were also equipped with FuG 25 "Erstling" IFF (identification friend or foe) equipment. 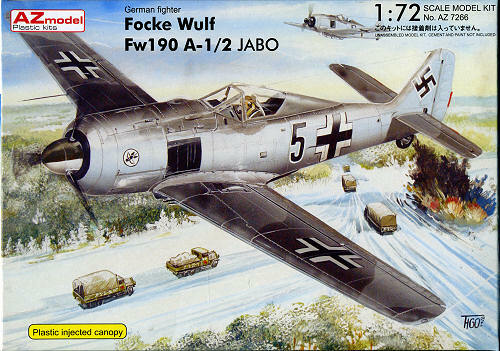 There were 102 Fw 190 A-1s built between June and late October 1941. The A-1 models still suffered from the overheating that prototype Fw 190s had experienced during testing. After only 30–40 hours of use (sometimes less), many of these early engines had to be replaced. Focke-Wulf completed 102 A-1s at the Bremen and Marienburg factories between June and October 1941. Also in October, a further order of 315 A-1s, subcontracted to AGO Flugzeugwerke at its Oschersleben factory, began to be built as A-2s. The introduction of the BMW 801 C-2 resulted in the Fw 190 A-2 model, first introduced in October 1941. As part of this upgrade, a modification to the exhaust system devised by III./JG 26's Technical Officer ("T.O.") Rolf Schrödeter was added. There were 13 exhausts for the 14 cylinders; eight of these were grouped to exit, four on each side, along the forward fuselage, just above the leading edge of the wing; under the forward centre section, between the undercarriage bays were five exhaust stacks, with cylinders 9 and 10 sharing a common pipe. To quickly implement the fix, it was found that the re-routing could be done easily in Gruppe workshops. The reduction in temperature affecting the bottom cylinder went a long way to solving the problem. The addition of new ventilation slots on the side of the fuselage further aided cooling, and with the widespread availability of the A-2 in the spring of 1942, the overheating problems were greatly reduced. The A-2 wing weaponry was updated, with the two wing root-mounted 7.92 mm (.312 in) MG 17s being replaced by 20 mm MG 151/20E cannons. With the introduction of the new cannons, the Revi C12/C gunsight was upgraded to the new C12/D model. The introduction of the A-2 marked a shift in air supremacy from the British, with their Spitfire Mk. V, to the Germans. German production records make no real distinction between A-2s and A-3s, which were very similar aircraft: the total combined production was 910 airframes between October 1941 and August 1942. In addition to Focke-Wulf and AGO, a new subcontracter, Arado, built A-2s and A-3s at Warnemünde. 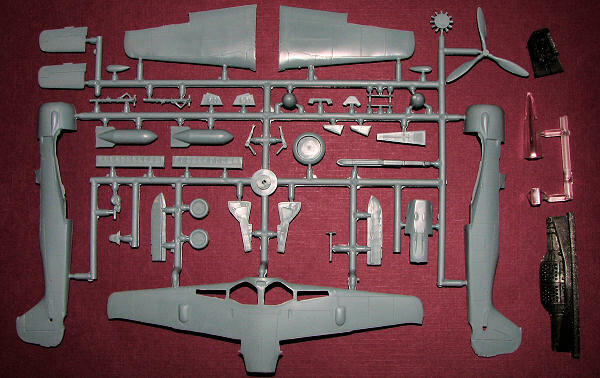 If you read the preview on the 190A-0, then this will be a bit of a refresher as the parts for the two kits are identical. There is no photo etch, for which I am glad. The majority of parts are on a single sprue and it appears this sprue is the same for all of their early 190 boxings. Molding is quite nice with some flash to take care of. It comes with an injected plastic canopy. It is fairly clear, though removing the sprue attachment mark will require some work. There is a separate windscreen. The wheel wells and cockpit are in resin. I was pleased with how thin the well section is as often these pieces require the builder to grind away on the upper wing sections to get it to fit. The cockpit is a complete casting with the seat and control stick already molded in place. One only adds the instrument panels to the cockpit. There are no rudder pedals, but frankly, in this scale they would be nearly invisible anyway once the cockpit is in place. AZ Model provides separate ailerons and flaps. From the look of things, they are designed to be modeled in the neutral position. The A-1/2 version has the standard spinner and that is provided. This version also had cooling slits just aft of the engine exhaust which are not molded into the kit's fuselage halves. Few will notice, but those concerned will have to consider adding them with a cutting disc or something similarly thin. A bomb rack and rather large bomb are to be used on this version. I had heard that the nose guns were removed from these aircraft to save weight, but the cowling piece was not altered when this was done. A nicely done metal tube is provided for the two wing root cannon barrels. One will need to cut these to l ength before installing. The kit also includes the inner gear doors that were typical of the early 190As. Instructions are designed for three different boxings of this kit and so one simply deviates from the standard build sequence where indicated for the different versions. Color information is provided and the instructions include the data markings guide. For the painting and decals guide, the back of the box is where one goes. These aircraft were painted in the RLM 74/75/76 scheme. No unit information is provided. Two planes have no mottling or theater markings on them, yet, from the box art, appear to be used in Russia during the winter of 1941/42. The third has fuselage mottling as well as a yellow rudder and lower cowling. These markings could be Russia or could be channel front as jabos doing hit and run raids over England were often so marked. The decals are quite thin and easily damaged. 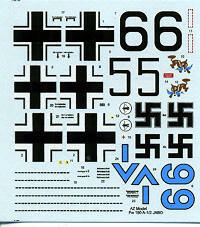 They are also well printed with no registration issues and the sheet contains complete swastikas (thank you). Another nice addition to the 190 line for those of us who like to collect the aircraft. I am sure this will be built at some time as I have few early 190s in the collection. I picked this one up at GreatModels, where you can get a bunch of neat new kits and some great deals.